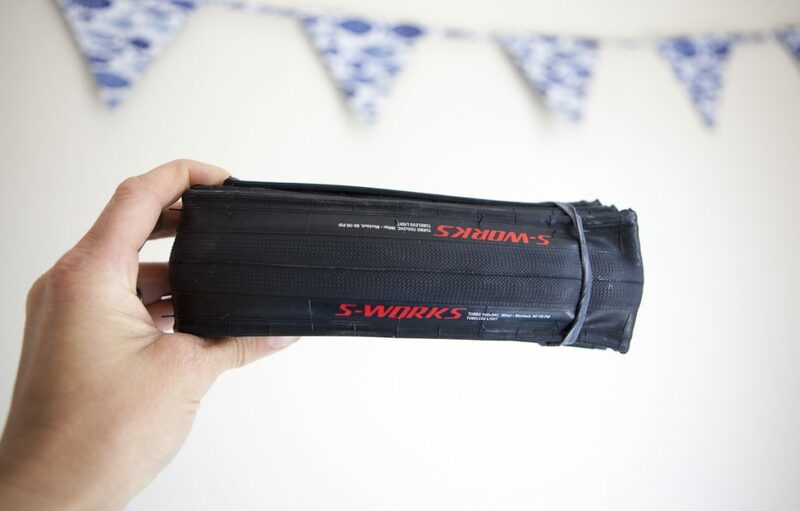 I’ve been racing on a pair of Specialized S-Works Turbo Tyres for several months and now that I’ve tested them in all weather conditions, I thought it high time I get my review up on here. The foldable clincher tyres are pitched firmly at the racing market, being billed not only as fast, light and supple but also as ‘the fastest tyres in the world.’ I really can’t comment on whether they’re the fastest in the world, not simply because I’m unable to prove that but also because there’s no independent data to back up this wild claim. But they are pretty light – 210g apiece in the 24c width I’ve been testing – and they do feel supple. As they’re such race orientated tyres, I thought it fitting to try them for the first time in a race. I wasn’t disappointed – they somehow feel fast, probably due to the low rolling resistance amongst other things. Then there’s the superior grip; Specialized have made use of two different rubber compounds, opting for a harder strip along the centre of the tyre to allow for speed and a softer compound on the sides that grips really well when your bike is at an angle, for instance when you lean into corners. 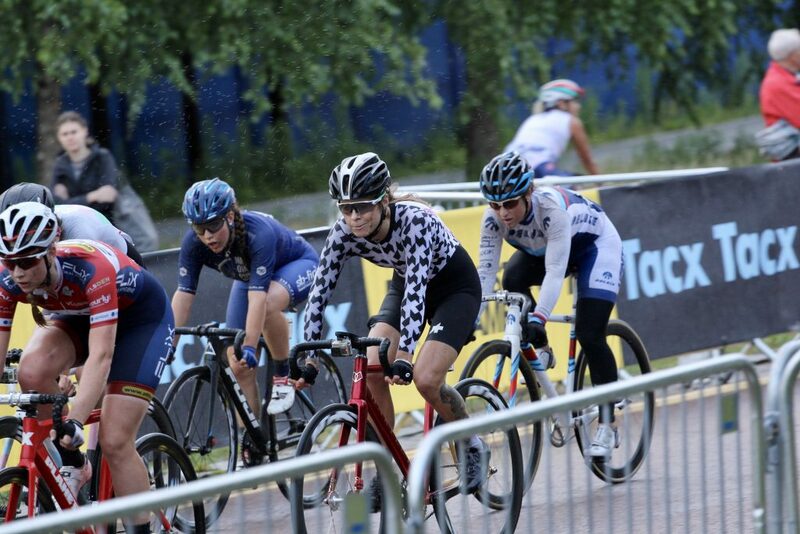 The dependable grip gives me great confidence in races, even in bad weather – I put my trust in these tyres in the downpour that was Red Hook Crit London. Relatively thin sidewalls aid in making the tyres feel fast and smooth and help minimise weight but that comes at a cost – I’ve kept these tyres strictly for racing as I’m aware that they might not be the most durable. At £33 a pop, I feel they’re best kept for special occasions – I don’t feel the need to train out on the roads on high end tyres. When it comes to puncture protection, there’s a ‘Blackbelt flat protection strip’ under the compound in the centre of the tyre that I’d hope that would help prevent too many flats, however there’s always a risk when using a slim, lightweight tyre. I did get a slice in them right before a race in Hamburg but Germany, unfortunately, seems strewn with glass thanks to their efforts at recycling so I’m not that surprised. The tyres are tubeless compatible so I’ve run them with both tubes and without to really get a feel for them. The main difference for me is that I can run them tubeless with a little less pressure which makes them grip even better than before as well as minimising the risk of a flat tyre (as long as the puncture isn’t too big and the sealant does its job). 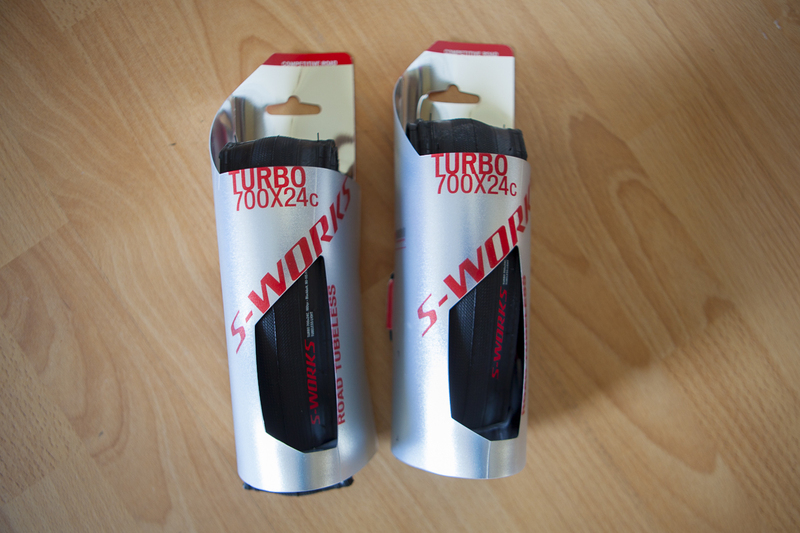 If you’re interested in these tyres, bear in mind that there are two versions – the ones I’m writing about here and the S-Works Turbo ‘Cotton,’ which are even lighter and more expensive but way less durable. Unless you have a team car complete with mechanic and spare wheels, I’d suggest you make the same choice as me. My verdict? My current favourite race tyres, they’re light, fast and smooth with low rolling resistance and excellent grip. Recommended. Thank you for your review! I knew about that independent website for testing rolling resistance and I was amazed by the poor score that this tyre got.